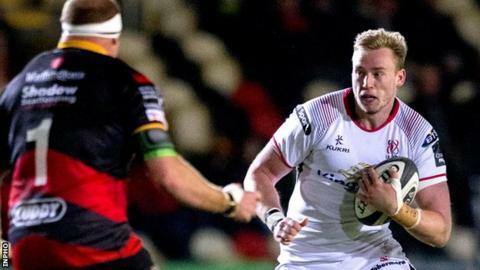 Ulster lock Kieran Treadwell could miss this weekend's game against the Dragons after sustaining concussion in the win over Zebre. It was announced on Monday that the 23-year-old second row will follow the return to play protocols. Treadwell, who has won three Ireland caps, picked up the injury as Ulster hammered the Italians 54-7 in Belfast on Saturday. Ulster sit third in Pro14 Conference B after 16 games. Treadwell represented England at U20 level but qualifies for Ireland through his Irish mother and made his Test debut during the 2017 summer tour to the USA and Japan. He moved to Ulster in the 2016-17 season having come through the ranks at Premiership club Harlequins. Treadwell signed a new contract last October which will keep him at Kingspan Stadium until at least 2021.